For the police helicopters in GTA III and GTA Chinatown Wars, see Police Helicopter (GTA III) and Helicopter (GTA CW) respectively. An airborne VCPD Police Maverick in GTA Vice City, in its first appearance in the series as a controllable helicopter. The Police Maverick ( also known as the VCPD Maverick in Grand Theft Auto: Vice City Stories) is the police adaptation of the civilian Maverick helicopter, and the first controllable police helicopter introduced in series when it debuted in Grand Theft Auto: Vice City. The Police Maverick possess many characteristics of the preceding police helicopter in Grand Theft Auto III. When flown by police units once the player obtains a 3-star wanted level, the helicopter has an "invisible" 25mm machine gun on the fuselage (sounding like the M60 while having the power of a TEC-9 or Micro-SMG. In GTA San Andreas, it has the sound of an AK-47 or M4), as well as a searchlight, and a loud speaker (used by the police to address the player from the sky) the last feature is absent in Vice City Stories rendition. The helicopter can also airdrop up to four SWAT units on ropes in GTA Vice City, GTA San Andreas, GTA Liberty City Stories, and GTA Vice City Stories, when the player's wanted level is 4 or more (3 in the case of GTA Vice City, where one unit will be airdropped). The Police Maverick handles in a similar manner to a normal Maverick, differing only by its ability to pitch steeper than a regular Maverick (especially in games prior to GTA IV). In addition, Police Mavericks obtainable by the player will have no microphone or machine gun fire. The search light is available on the GTA San Andreas rendition (see #Trivia). Like the Maverick, the helicopter has made repeated appearances in Grand Theft Auto: Vice City, Grand Theft Auto: San Andreas, Grand Theft Auto: Liberty City Stories, and Grand Theft Auto: Vice City Stories. In GTA Vice City, GTA San Andreas, and GTA Vice City Stories, the helicopter is usually always parked on the roof of the main police station of the city. In GTA Liberty City Stories, it is also not available in a normal game, but can be obtained by a third party trainer program. Like the Maverick, the Police Maverick originally featured two rotor blades. With the exception of GTA San Andreas, two versions of the Police Maverick exist in all its appearances between GTA Vice City and GTA Vice City Stories. Airborne Police Mavericks operated by the police feature its back doors slide back, but the same back doors of Police Mavericks available to the player swing open instead. In GTA Vice City Stories, the slide-door variant retains GTA Vice City's green and white livery while the swing-door variant is only available in a olive/gold and white livery. The slid-door variant is not normally available to the player, but it is possible to spawn a slid-door VCPD Maverick in GTA Vice City Stories through a CheatDevice. 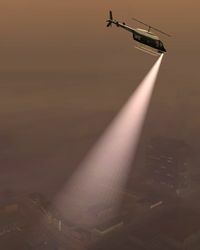 In GTA San Andreas, on random occasions (usually around 21:00 in-game time), a Police Maverick will spawn and will hover above the ganglands of Los Santos or San Fierro with its searchlight on. It can be shot down. However, doing so will immediately give the player a 3-star wanted level. During the Los Santos Riots, these random encounters significantly increase. In GTA Vice City, GTA San Andreas, and GTA Liberty City Stories, there is no visible pilot flying the helicopter when it is flown by an NPC. This visual goof was rectified in GTA Liberty City Stories by simply having the windows of the helicopter blackened, obscuring the interior; Police Mavericks spawned using a CheatDevice, however, feature transparent windows. In GTA Vice City Stories, there is a pilot appearing as a normal police officer without any pilot gear. Once the player has destroyed a VCPD Maverick in GTA Vice City Stories, it drops a Pistol and a Nightstick from the dead pilot. GTA Liberty City Stories, available only through CheatDevices. Unlike other helicopters, the main rotor blades disappear when spinning at full speed. GTA Vice City Stories, as a "VCPD Maverick". GTA Vice City Stories, unobtainable slide-door variant available only through CheatDevices. In Grand Theft Auto IV, the Police Maverick is in turn based on a redone Maverick, and as a result, features a rear slid-doors and a four-blade main rotor. In place of an "invisible" machine gun under the fuselage are two officers seated on both sides of the helicopter, programmed to shoot the player with M4A1 assault rifles; its ability to deploy tactical response units has also been dropped in the game. In The Ballad of Gay Tony, the officers are armed with Advanced MGs (M249 SAWs) instead. The Police Maverick is slightly faster than a regular Maverick and can turn faster, thus giving it more maneuverability. An LCPD Police Maverick in GTA IV, with a police officer seated on the side ready to take aim at the player. A police helicopter that appeared in the first trailer for Grand Theft Auto V shares the body of GTA IV's Police Maverick, but had a different paint job to match the LSPD livery. A a new police helicopter model resembling a Eurocopter AS350 (which are more common than Bell 206 helicopters in the Los Angeles Police Department) was later revealed one of the first pre-release screenshots for GTA V. The Police Maverick based on the Maverick appears to have been cut out of the final version of the game (though the civilian version remains), making way for the first Police Maverick in the series not to be based on the civilian Maverick. The searchlight remains unusable by the player, but two side-mounted headlamps can be turned on by the player. An LSPD Police Maverick in GTA V.
A Police Maverick as seen in the first GTA V trailer. In GTA Vice City, the police pilot voice actor is arguably the most intimidating police pilot in the GTA series. AI-controlled Police Mavericks during peaceful flyovers and during police pursuits do not feature any pilots. This problem is resolved in the GTA Vice City Stories rendition, where it features a pilot that can be killed via gunshots. An activated search light on the player's Police Maverick in GTA San Andreas. During development of GTA San Andreas, there were LSPD Police Mavericks. GTA San Andreas is the only GTA game to date that allows the player turn on its powerful search light, but its the direction can only be controlled in the PC version - in console versions, it moves in the opposite direction to the movement of the helicopter. The light can only be turned on at night by pressing the left analog stick (Xbox), R2 button (PS2) or Left Shift key (PC). If the player manages to steal the Police Maverick in GTA San Andreas, the helicopter will remain hostile. For example, if the player parks the helicopter and gets out, the helicopter's underbelly will shoot at the player from the ground; however, this is due to programming limitations. In GTA San Andreas there is a glitch where in 2-player mode, if player 1 steals the helicopter and player 2 commandeers it, the helicopter will still remain hostile. In GTA San Andreas, the mounted gun oddly bypasses any coding that would make the object/character invincible. For instance, it will damage the player even if the "Invincibility" cheat is activated. It also can damage the Rhino or any bulletproof vehicle, which would be impossible with any other firearm; only a Molotov Cocktail, flamethrower, and crashing the tank have the ability of damaging the Rhino. In GTA San Andreas the player is able to steal the Police Maverick chasing them on certain occasions. In GTA San Andreas, the helicopter will not shoot at the player if he is in any vehicle classified as an aircraft, including the Vortex. To ensure the player does not manage to gain control of an NPC Police Maverick in GTA Liberty City Stories, the helicopters are programmed to explode upon contact with the player, or fly higher than the player. While all Police Mavericks have a police radio, the GTA Liberty City Stories rendition is equipped with a conventional radio. The Police Maverick in GTA Vice City Stories is the first in all the GTA series (excluding GTA 1, GTA 2, and GTA Advance) not to feature a loudspeaker. Although it has an actual pilot, no comments are ever made towards the player. Similar to GTA San Andreas, the player is able to steal a Police Maverick chasing them on occasions. A glitch is present where the Police Maverick will automatically fly away once the player gets out, only to fall from the sky seemingly due to a lack of pilot control; this problem is attributed in the fact that the game still identifies the helicopter as being AI controlled. To prevent this, the player must hold the button/key that is used to exit a vehicle (Y (Xbox 360) or Triangle (PS3)), thereby shutting off the engine. The glitch has been fixed for the PC version of the game. In GTA IV, it is possible to "disarm" the Police Maverick without killing both sharpshooters, which would cause the helicopter to retreat. Instead, if the player kills one of them, and then shoots the gun out of the other's hands, he will drop it and start shooting with his pistol. You can shoot this one out of his hands, but it is more difficult since it is smaller. Be sure to shoot the actual gun, and not his hands, and this will eventually kill him. Also, crouch down to increase accuracy. It is possible to use the Police Maverick to obtain the One Man Army Achievement in GTA IV. First, the player has to obtain a six star wanted level either using cheats or by killing civillians and destroying vehicles. Once the six stars have been obtained, the player is to fly the Police Maverick as high as they can while at the same time making sure thay they stay inside the search radius. Wait five minutes and the player should gain the achievement. The Police Maverick appears in Rockstar North's Manhunt 2, bearing the VCPD's color scheme. Although there is an article on the Liberty Tree stating that the LCPD did not use helicopters until 2001; police helicopters appear in GTA Liberty City Stories, which is set in 1998. This could be due to the LCPD testing out police helicopters at the time. On top of the LSPD rooftop in Pershing Square, Los Santos after completing the mission Learning to Fly. Only obtainable by sniping the pilot, making the helicopter slowly hover to the ground undamaged. It only works 5/10 times. Also obtainable by an even more frustrating process in which the helicopter is disabled at a low enough altitude that all occupants live, and then the chopper is pushed into a safehouse parking spot. That method works less often than the previous. Other than that, you can only fly the Police Maverick in multiplayer race mode. Note that If the player manages to lure the helicopter over the pond in Middle Park, it will be easier to obtain, although the helicopter must have an open space and the water must be shallow. (Multiplayer only) On the rooftop helipad of the East Holland police station in Algonquin. During the mission "Not So Fast", you can steal a Police Maverick when you have to climb back on to the roof to get back in Yusuf's Buzzard by waiting a few seconds, when a Police Maverick will land on the roof. Occasionally parked on a helipad in the police station near the Towing Impound. This page was last modified on 23 June 2015, at 17:58.